Hi ! Planning to build the amiga towers and I will have a few questions along the way...let's start with screws. What kind of screws should I buy with the amiga kit to install the woofer and tweeter ? Do I need t-nuts or just regular #6 or 8 screws straight in the mdf ? Hello and welcome to the world of DIY, I'm sure you will love the Amigas. 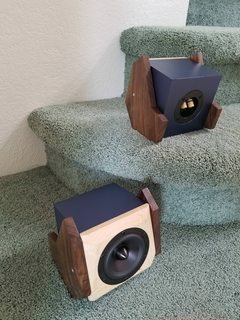 I've built four pairs of speakers and use regular, good quality wood screws to mount the drivers, without any problems to date. I pre-drill the holes first of course. I use plain screws so that there's a contrast with the driver surrounds, which I think looks cool. Regular screws are fine if you won't need to remove the woofer multiple times. Do you plan on using the woofer hole to get the finished crossover into the enclosure? I use #8 for most woofers and #6 for tweeters. Some tweeters will take a #8, but I don't think the DX25 will. A bag of 100 screws is cheap, so you might as well just get both. I know a few people here put a drop of superglue in the threads to firm up the MDF in case they need to remove a driver. I like the number 6 black oxide screws. PE has them as well as many others. I've also sanded and painted zinc round head screws from HD. Okay but I don't plan to remove the drivers except for the finishing step where I might remove them for the only time. Should I get t-nuts in that case ? I've had to remove a couple of drivers from time to time, for example, when I've discovered an air leak or one of the connectors has fallen off, which can happen when you move the speakers around. I find that screws do the job and give you some flexibility. And here's a very handy hint from someone on PETT, my apologies I can't remember his name: sawdust and PVA make great wood filler! All right and before ordering my kit, I realized that my plan might not work !! The front baffle in the kit has a roundover all around which is gonna be impossible to veneer. I was planning to veneer the whole box, I'm new to veneering so applying a veneer to a tight roundover like this is asking for troubles....such a bummer, I wonder why they put a roundover in the first place in a diy kit. Any ideas ? The black oxide finish PE screws are fine. Multiple removal cycles can be dealt with by filling the old holes as mentioned above, or simply rotating the driver to expose fresh mdf. Many speakers have veneer with a painted baffle. Also suggest you look into PSA (pressure sensitive adhesive) veneer. Peel and stick. I have pair of speakers from 2009 using psa veneer and painted baffles, still looking fine. If you haven't ordered the Amigas as yet, the PE black screws (shown below) will be fine. Maybe just the number 6 is all you need. As Geoff mentioned, pre-drill the holes. Then, drive the screws in, lightly, and back them out. Now fill the holes with wood glue, wait 10 min. 's and reinstall the screws. Let dry over night. The wood glues seeps into the mdf and, when hard, strengthens the hole and creates "threads" for the screw. And you can always back out the screw later as wood glue doesn't adhere to the metal screw. I like those baffles! It's a nice subtle texture. What paint did you use? Some Rustoleum rattlecan texture paint. The roundover helps with diffraction and typically is an improvement in sound quality. This is a pretty good speaker, so I'm sure the thinking was sound quality vs ease-to-build. You MIGHT be able to veneer it. I know people are able to veneer a 3/4" roundover; the key is typically that some veneers are more flexible than others and you can also use veneer conditioner or softener or something that helps. I'd try Googling "veneering a 1/2 inch roundover". It is possible to veneer those corners, but is more than I would personally want to take on. Paint often looks great, but remember the key to a good finish is good prep. In the alternative, I have been experimenting with using automotive vinyl as a finish. You can apply it more easily around corners, it is cheaper, and it comes in a wide variety of styles. Here is a little example of my surrounds that used vinyl. The trick with vinyl is properly sealing the wood first so the vinyl sticks. Shellac and spray primer both work fine. This is all vinyl wrap. AVSforum source image search. This is all vinyl wrap. That wood grain is probably 3M Di-noc. They have some pretty good looking stuff.